Who ever said that Russian cusine was bland and dull, is sadly mistaken. The person was surly devoid of tasting Stroganoff. Though over the years this recipe has come up with various variations but the basic remains the same; meat cooked in sauce and served over a pasta base. Various explanations are given for the name, presumably derived from some member of the large and important Stroganov family, perhaps Alexander Grigorievich Stroganoff of Odessa or a diplomat, Count Pavel Stroganov. 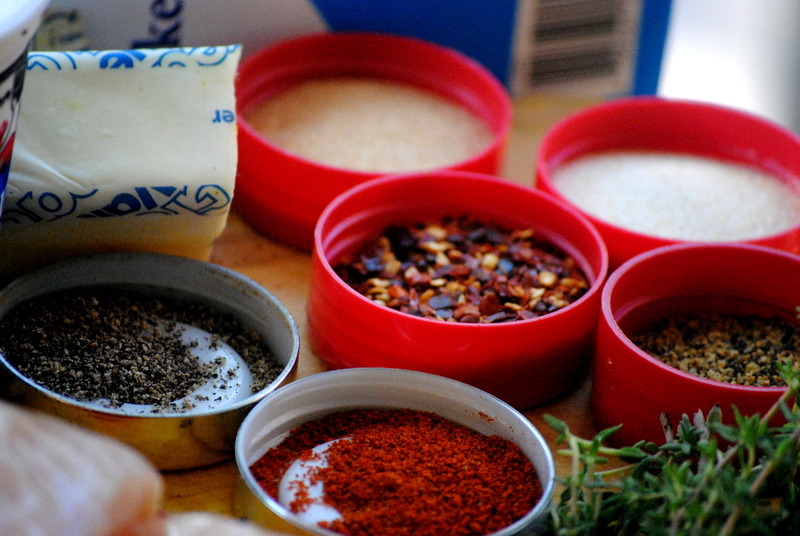 In her book the Gift to Housewives, Elena Ivanovna Molokhovets gives the first known recipe for Govjadina po-strogonovski, s gorchitseju “Beef à la Stroganov, with mustard” which involves lightly floured beefcubes (not strips) sautéed, sauced with prepared mustard and bouillon, and finished with a small amount of sour cream: no onions, no mushrooms. 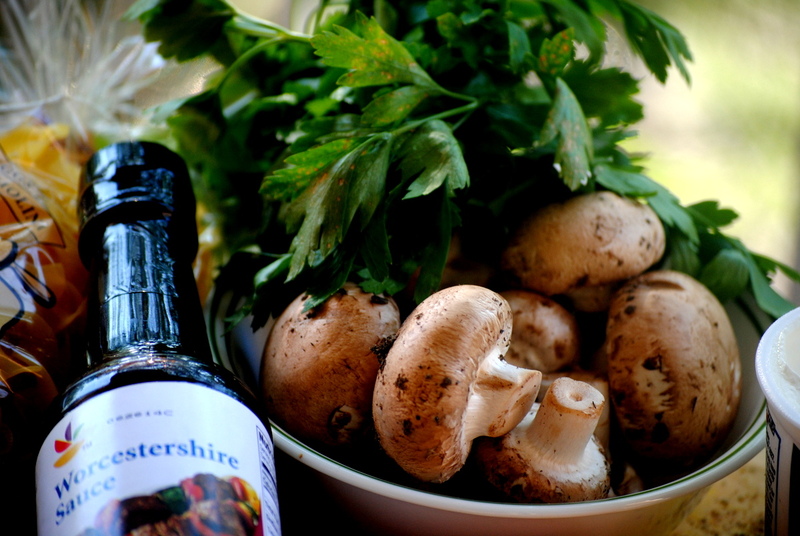 But over the years, and the different cultural influences, mushrooms have become an integral part of the dish. Ingredients: ( I have followed the exact proportion) and the recipe , I will still write it out. How:Start by heating a large pot over medium-high heat. 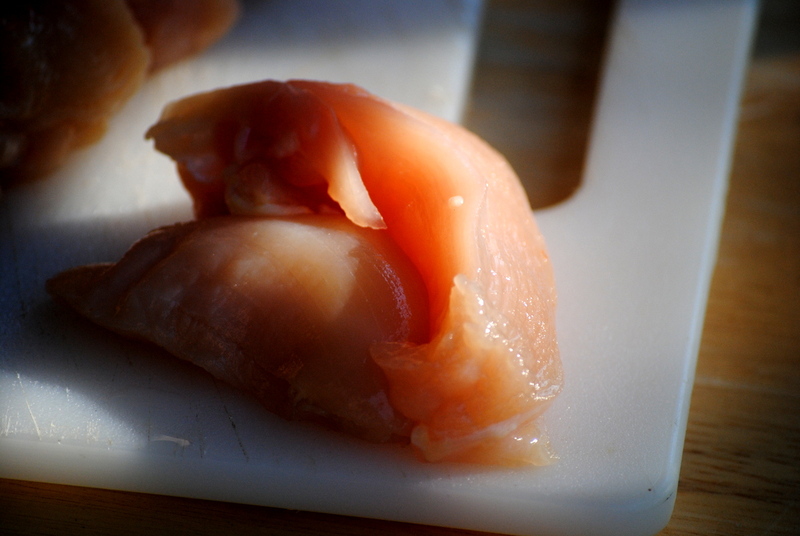 Meanwhile, cut the chicken into 1-inch strips, placing them into a bowl. 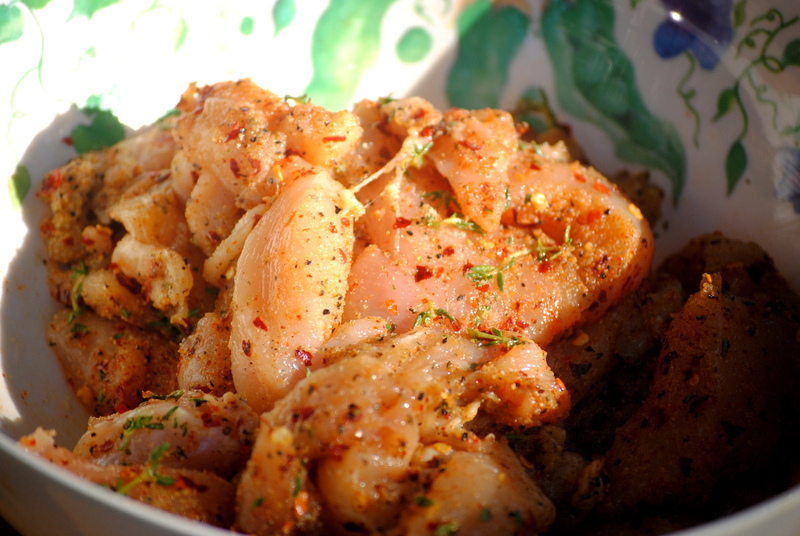 Season with garlic powder, onion powder, paprika, crushed red pepper flakes, thyme, and 1/2 teaspoon each of salt and pepper. Toss thoroughly to combine. These are way too addictive, watch out!! Drizzle in about 1 tablespoon of the oil into the preheated pot, and cook the chicken and brown the chicken about 2-5 minutes on each side. 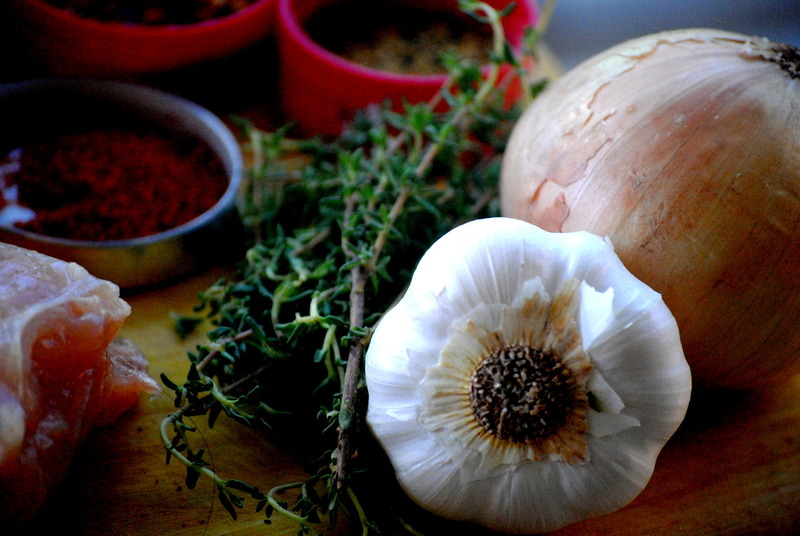 , this step is just to develop color and flavor. 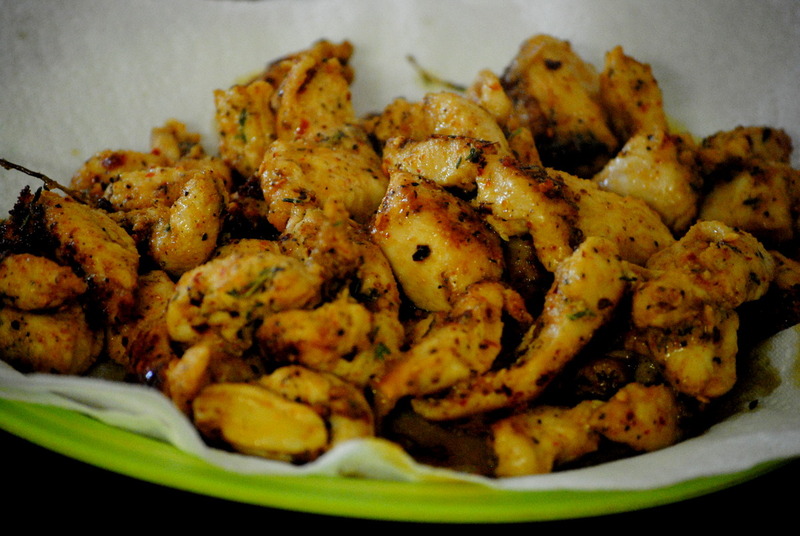 Continue sautéing the chicken, in batches, until it is all browned. Transferring the finished pieces onto a plate to rest. Add some more oil , followed by the chopped onions and garlic to the pot. 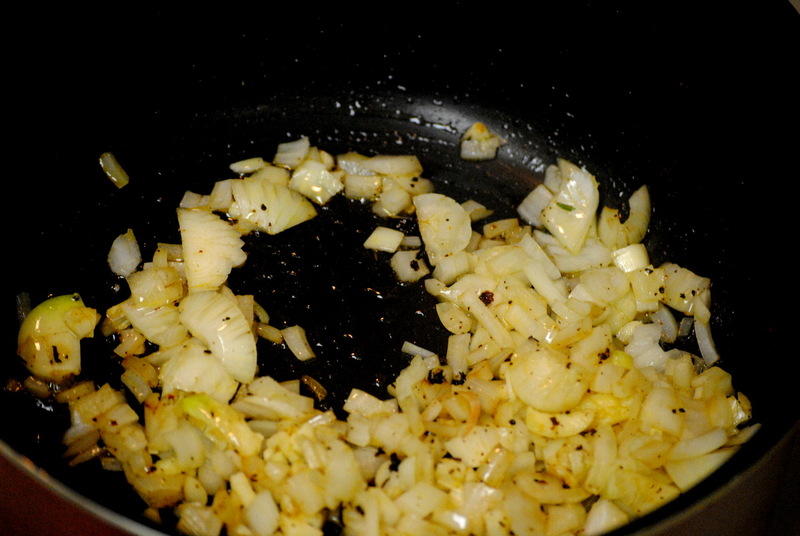 Stir occasionally and allow to caramelize until the onions are soft and translucent. Add the sliced mushrooms. 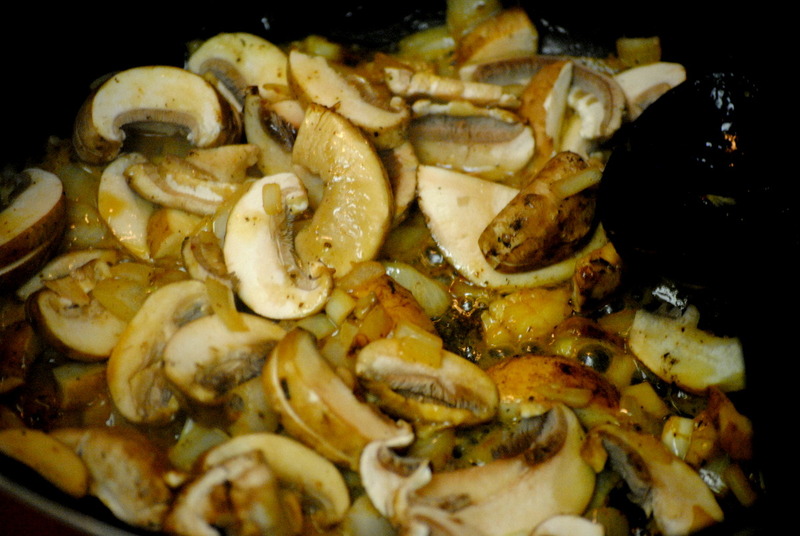 Season with a pinch of salt and pepper and stir coating the mushrooms completely with the oil, onions and garlic. 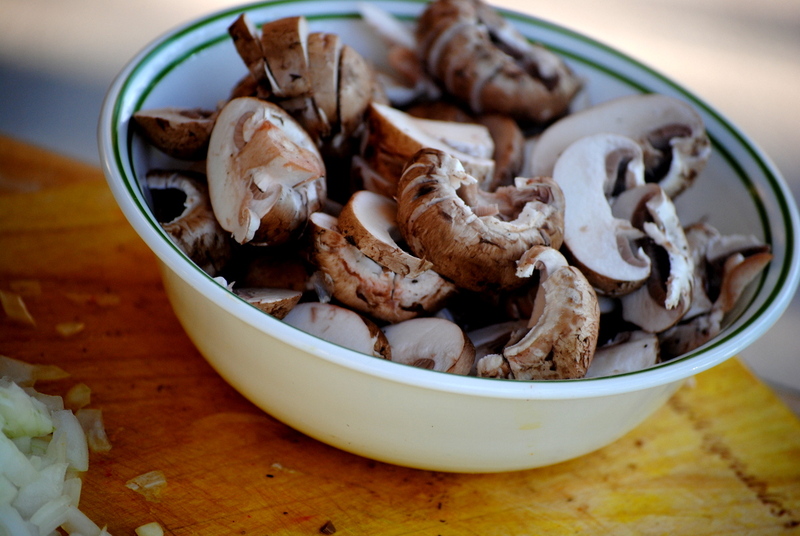 Cook for about 5 minutes, or until the mushrooms are browned. Make a well in the center of the pot. 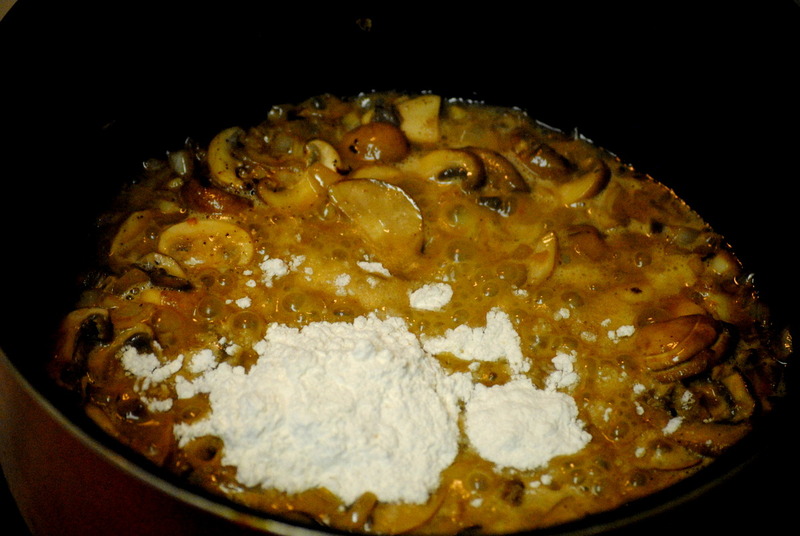 Add the butter and flour, mixing together to make a roux. Cook for about a minute to let the raw flour taste cook off. 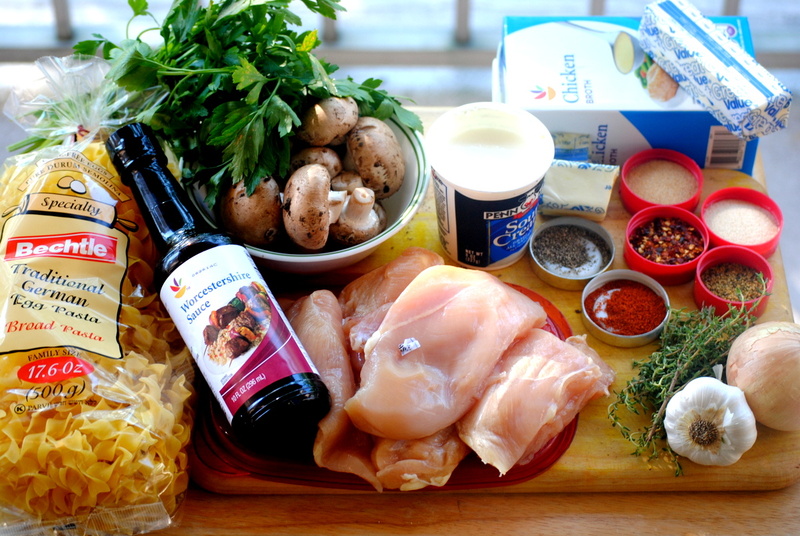 Then, stream in the chicken stock while you mix everything together. Add the worchestire sauce and stir once more. Lower the heat to low and allow the sauce to thicken and bubble slightly. 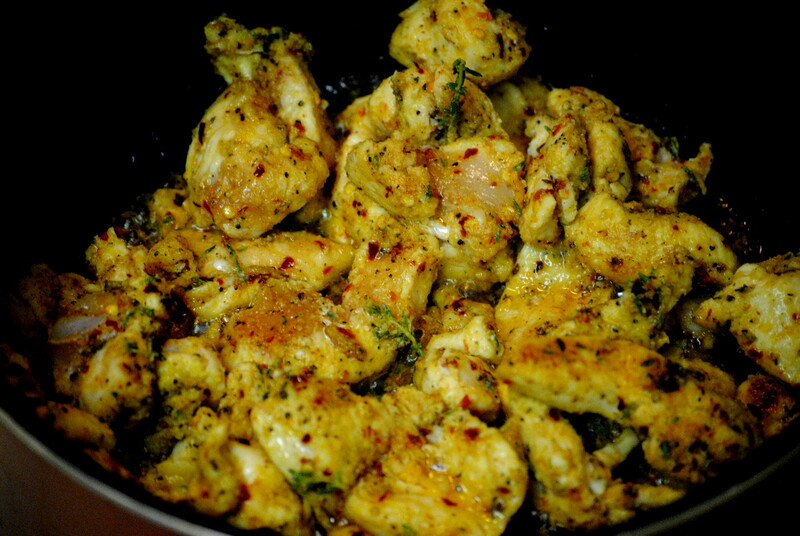 Throw in the chicken, along with the juices, and continue to cook, on a simmer, for about 5-10 minutes. 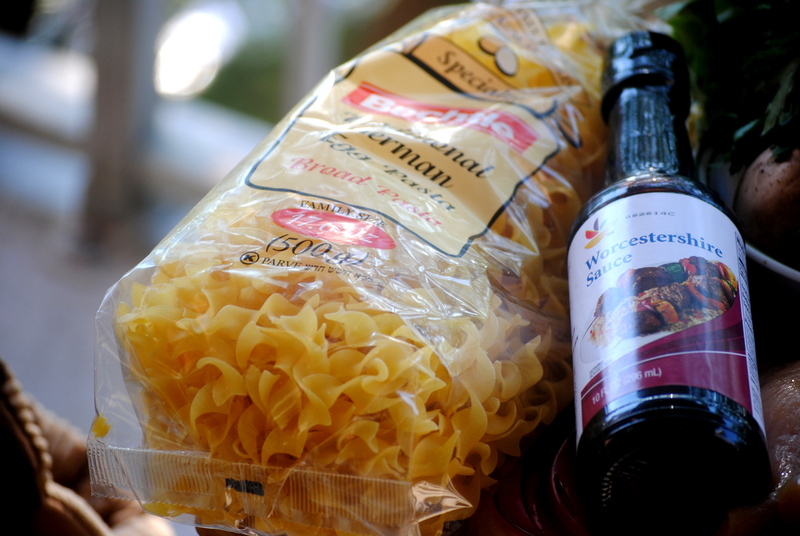 In the meantime, follow the instructions on the egg noodle package to cook. 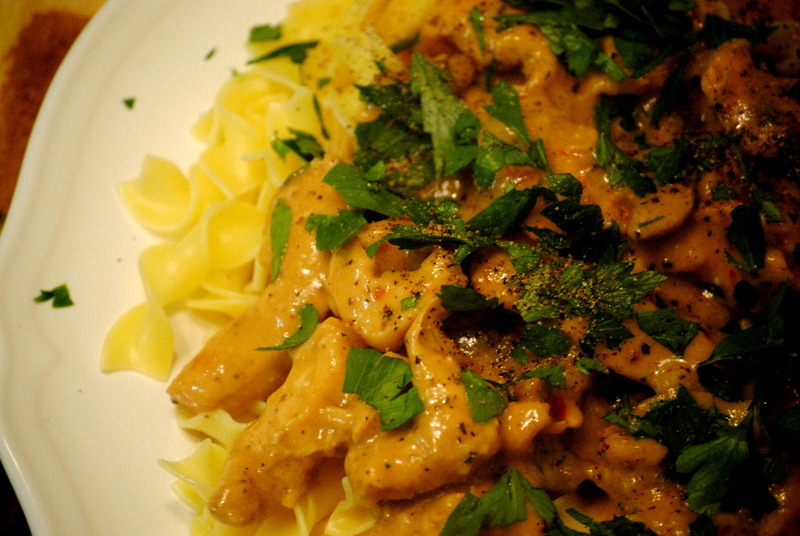 Pasta should be slightly tender or “al dente.” Drain and let sit for a minute while you finish the sauce. To the sauce and chicken, add the sour cream, and season once more with a pinch of salt and pepper. Stir together and bring to a simmer. 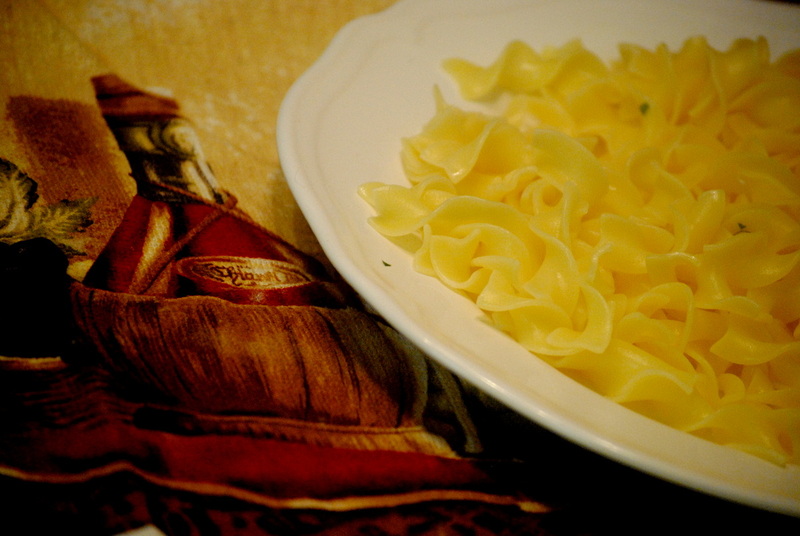 Toss in the egg noodles, I used Traditional German Egg pasta, but you can use any egg based noodles or pasta and sprinkle with the chopped parsley for garnish. . Garnish with a dollop of sour cream and chopped parsley. Serve right away. 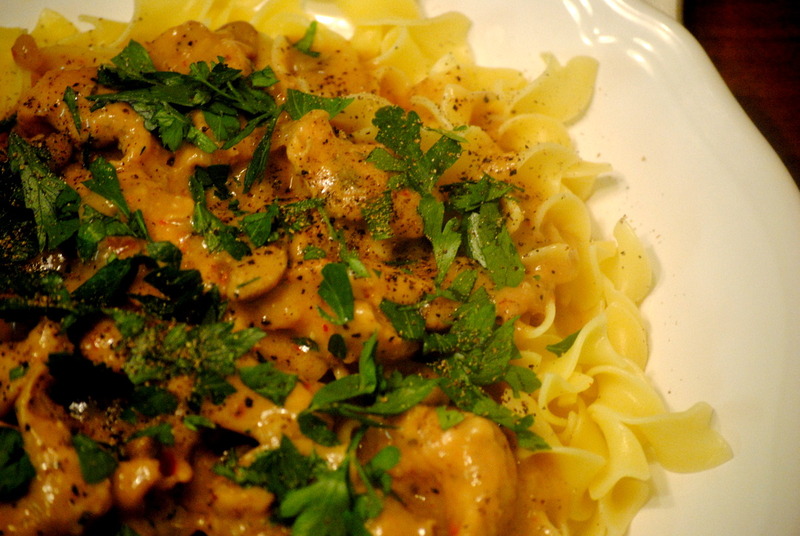 ***Stroganoff can be made in advance and stored in the fridge. 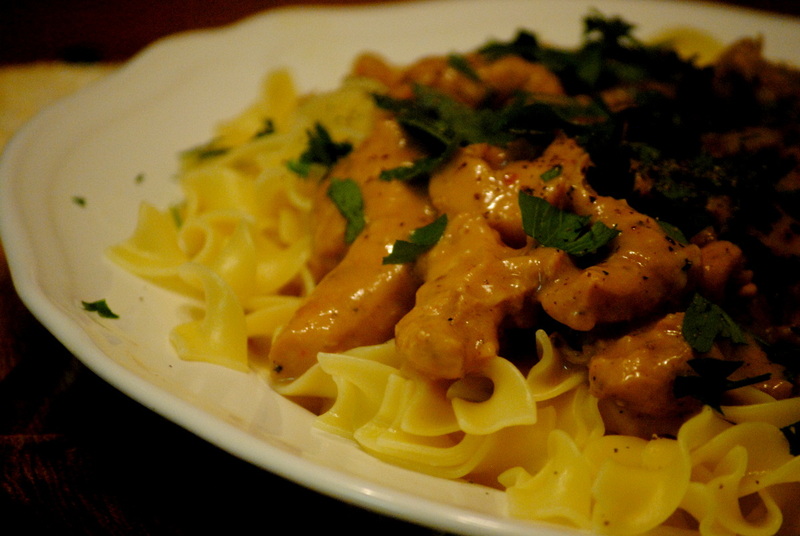 When ready to serve, just reheat on the stove and cook the noodles, then simply toss together. Enjoy.